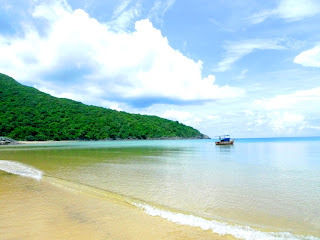 Con Dao is an archipelago including 16 islands in the Southern sea of Vietnam which belonging to Ba Ria- Vung Tau province. In the last decade, people called it Con Son or Con Non. Also, it was called Poulo Condor in French and English. According to Travel and Leisure, Con Dao is 45 minutes from Ho Chi Minh city as the crow flies. by many international traveling experts because of a long list of beautiful landscapes in this island. First of all, Con Dao certainly satisfy people who are interested in Vietnamese history. It is very famous for its painful history. Vietnamese used to call it “ the hell in life”. This was the prison where French army kept their victims and tortured them to die. It is very hard to discover all 127 jails, 42 cells and 504 isolated rooms which were built during 113 years fighting to gain the independence. However, Con Dao has been changed to become one of the most impressive places of interest. Tourists will have the chance to behold spectacular mountain scenery and wild nature filling the tangy scent of salt. There are 200km coastline long in Con Dao with numbers of amazing beaches and breathtaking coral reefs. Besides, tourists should take a sightseeing to Con dao National Park where existing 285 pieces of plants and 100 pieces of rare animals and lots of valuable products. Tourists who are interested in adventure can try adventurous entertainments such as diving in coral reefs and shark hunting. Tourists can both rest on the beaches and prepare seafood while angling sharks. Con Dao has been selected to one of the most romance islands in the world with the most qualified hotels by Travel and Leisure and Lonely Planet.